In Trout’s first full season, he was simply amazing. He hit .326 with 30 homers, 83 RBIs, 129 runs, and 49 steals. It gets better. Trout didn’t play in most of April, which means he didn’t play as many games as he could’ve. It gets better. Trout is now used to the MLB and should be able to IMPROVE on last year’s performance. It gets better. The Angels just added Josh Hamilton to their lineup which already included Pujols and Trumbo. Trout is arguably the best fantasy hitter coming into the 2013 season. I prefer Cabrera, who is more of a sure thing since Trout is still young, but you can’t go wrong with either. Braun is arguably the best fantasy option available. He does it all. He hits for a high average, has tremendous power, always scores and drives in 100+ runs, and he even steals 30+ bases. Braun has the full package and will be taken as one of the first few picks on draft day. Kemp is one of the best players in fantasy. 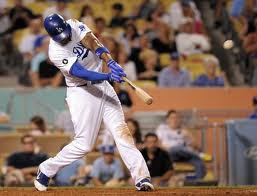 He had an amazing season in 2011 hitting .324 with 39 homers, 40 stolen bases, 115 runs scored, and 126 RBIs. He couldn’t repeat those numbers last year because of injuries. But Kemp is back now and should be able to duplicate his 2011 numbers. He even has a much better lineup now. He’s one of the best outfielders and will be gone in the 1st round. Hamilton crushed 43 homers last season and drove in 128 runners. He also scored 103 runs and hit .285. That’s an amazing season. His batting average numbers are usually better too. He is now in a better lineup, which should benefit Hamilton even more. He’s one of the top options in all of fantasy baseball and should be taken as your 1st outfielder during the 1st few rounds. Bautista is a good option as your first outfielder. In just 332 at bats, Bautista hit 27 homers and drove in 65 runs. He has proved that, when healthy, he can hit 40+ homers and even hit for a high average. Take Bautista as your number 1 outfielder early in the draft. McCutchen had a great season last year. He hit .327 with 31 homers, 20 stolen bases, 96 RBIs, and 107 runs scored. He was great in every aspect and should be just as good, or maybe even better, for the upcoming season. He’s a good option as your number 1 outfielder. Stanton is one of the best young hitters in the game. He hit 37 homers last season while maintaining a .290 batting average. He could improve to 40+ homers this season, and maybe even bring hit average to over .300. He still has a lot more upside in him, and he’s already one of the best. He’s a good choice as your 1st outfielder. Gonzalez is a great all around player. He hits for a high average, gets 20+ steals and homers a year, and gets 85+ runs and RBIs a year. He’s hit 30+ homers before, but he’s been more in the 20s range in recent years. However, Gonzalez is entering his prime this year at age 27, and he could bring his power numbers back up. This makes him a great option as a number 2 outfielder, and not a bad option as your number 1. Upton is a very good hitter. However, he’s pretty inconsistent. Just when you think he reached his potential of being a great all around hitter, he has an off-year. However, his off-years aren’t too bad. It’s worth the risk drafting him early because if he has one of his great years, than he’ll be one of the best players on your team. He’s still a starter during his off-years, however. Let’s assume we’ll see the good Justin Upton this year, which makes him a great option as your second outfielder, and a pretty good option as your first. Ellsbury is coming off an injury ridden season in which he only had 303 at bats. The season before that, he hit .321 with 32 homers, 39 stolen bases, 105 RBIs, and 119 runs scored. It’s possible for him to do that again since he already did it, but he probably won’t be that good this year. Still, he should be almost that good, which makes him a great option as a number 2 outfielder, and a nice option as your number 1 as well. Jones broke out last season hitting .287 with 32 homers, 82 RBIs, 103 runs, and 16 stolen bases. He’s still developing as a hitter, which means that Jones should improve on that this year. Take him early in the draft. He’s a great option as your number 2 outfielder, and a pretty good option as your number 1. Granderson has 40+ homer power which he has proved over the past couple of seasons. However, he does not hit for a high average at all. He makes up for it with his homers, and he also scores a lot and drives in many runs. He used to steal a lot of bases too, but last year he only stole 10. He should be able to return to the 20+ mark though, which makes him a great option as your second outfielder, and not a bad option as your first. Holliday is a great player. He hits for high average and very good power. He can hit over .300 and over 30 homers consistently, which makes him a very good number 2 outfielder, and not a bad option as your first. He’s been falling in drafts, maybe because of his age, but don’t be scared to take him. He’s still very good. Rios was very good last season. He hit .304 with 25 homers, 91 RBIs, 93 runs, and 23 stolen bases. He should be able to put up around the same numbers this year, which makes him a nice option as your number 2 outfielder. Bourn is a solid number 2 outfielder. He steals 40+ bases a year which is an amazing feat. He also scores a lot of runs and hits for a decent average. He doesn’t really have power, but his steals make up for it, which makes him a pretty good option on draft day. Upton is a pretty good player. While he isn’t too great of a hitter for average, he still has good power and speed. He can hit 30 homers and steal 30 bases, while driving in and scoring about 80 runs. That’s good enough to make him a nice number 2 outfielder. Pence is a solid option as your number 2 outfielder. He hits around .285 with 25 homers and drives in and scores around 90 runs. He even steals between 10-20 bases usually. All of this adds up to a pretty good outfielder. Take him in the middle rounds. Trumbo was pretty good last season. He hit .268 with 32 homers and 95 RBIs. It’s obvious that Trumbo is a great hitter for power and could hit even more homers this year. Being in a lineup with Trout, Pujols, and Hamilton will also help his numbers. He’s a solid option in the outfield or at 1st base. Bruce is a very good power hitter and keeps getting better at it. He hit 32 homers in 2011 and 34 in 2012. He’s only 25, so he is still improving and could hit 35, maybe even 40 this season. He only hits around .250, but his power makes up for it which makes him a solid option as your number 2 outfielder. Athough Harper wasn’t as good as Mike Trout was last year, he was still very good. He’s one of the most highly touted hitting prospects in baseball history and he could breakout this season. If not, what he did last year was good enough to be a fantasy starter anyway. But if he breaks out, he could be as good as anyone. Take him as your number 2 outfielder and hope that he breaks out. Heyward proved his hype to be true last season while hitting 27 homers and stealing 21 bases. He should be even better this season, which makes him a solid option as your number 2 outfielder. He’s very young, but he also has proved himself to be worth the hype. Cespedes was good during his rookie season in Oakland. He hit .304 with 23 homers, 70 runs, 82 RBIs, and 16 stolen bases in just 487 at bats. He should improve if he remains healthy over the course of a whole season. Cespedes is good in all aspects and is a good option as a number 2 outfielder on draft day. Melky doesn’t blow you away in any one category, but he does a little of everything. Well, he did hit .346 last year, but he missed the end of the season after being suspended due to taking PEDs. His batting average was probably a fluke, but he still can hit .300 with 15-20 homers and stolen bases, 90+ runs, and 80+ RBIs. He’s also part of an amazing lineup in a hitters park. He’s a good option as your number 2 outfielder. Beltran is a good player. He hit 32 homers last season and drove in 97 runs. Although he is getting older, he proved that he can still hit a lot of homers. His average dipped a little bit but it should go back up this season. He’s a solid number 2 outfielder. Ethier is good enough to hit for a fairly high average and 20+ homers, and he has the potential to do even more. The Dodgers lineup is vastly improved with Crawford, Gonzalez, and Hanley all entering it for a full season. Don’t forget about Matt Kemp either. If he hits his usual .290 with 20 homers, he’s a good number 2 outfielder. But if he hits 30+ homers like he has done before, he will be a steal this late in the draft. Carl Crawford hasn’t been healthy the past few years, but he is healthy for this season. He has an amazing lineup behind him and that should help him greatly. If he could remain healthy, there’s no doubt in my mind that he can return back to old form. Take him as a number 3 outfielder, but he should perform like a number 2, maybe even a number 1. Jennings is a pretty good option as your 3rd outfielder. Although he hasn’t hit for average in the major leagues his one and a half seasons, he has always been known for his batting average in the minors. Maybe this is the year he will breakout and bring his average up to .300. That means more runs and stolen bases. He also has some pop in his bat which makes him more valuable. Take him during the middle-to-late rounds. For some reason, Choo was projected as a top outfielder 2 years ago. He ended up getting injured and only having 313 at bats, in which he wasn’t that great. He was healthy in 2012, but he was nothing special. He hit .283, with 16 homers and stole 21 bases. I think he could improve in all those aspects a little, but he’s not as good as was was projected to be before the 2011 season. He’s a good option as a number 3 outfielder. Jackson was pretty good last year. He hit .300 with 16 homers, 12 stolen bases, 103 runs, and 66 RBIs. He missed some time last year so he should get more at bats. He should be able to hit 20+ homers and steal 20+ bases, while scoring a lot of runs, maintaining a high batting average, and even driving in a nice amount of runs. He’s in a great lineup and he’d be a good option as a number 3 outfielder. Craig surprised a lot of people last year by hitting 22 homers and 92 RBIs with a .307 batting average. He missed the beginning of the season too. I expect around the same numbers from Craig. Maybe 25 homers. He’s a decent option as a number 3 outfielder. Victorino is a pretty good outfielder. He is very fast, which means he steals a lot of bases and scores a lot of runs. He also has some pop, which helps as well. He’s a pretty good option as a number 3 outfielder. Morse was very good in 2011 hitting .303 with 31 homers. He was expected to be even better in 2012, but he suffered many injuries. When he did play, he still played well. His value is a lot lower now, but he could still put up his 2011 numbers in Seattle next year. He’s a good option as a number 3 outfielder. Davis hit 33 home runs last season. I definitely think that’s possible for him to do again. He should also be able to bring his batting average up. Davis is a great hitter for power and finally proved it. He’s probably gonna be taken as a first basemen, but as an outfielder, he’d be a solid number 3. Willingham slugged 35 homers last year for a career high. While I don’t think he will reach that many homers this season, it still can’t be ignored. He should hit high 20s/low 30s in home runs, which makes him not a bad option as your 3rd outfielder. Cruz is a good player. He hasn’t been too consistent, but he has the ability to hit great for both power and average. If he does so on the same year, he could be a very good player. If he only does 1 great and 1 decent, he’s still pretty good. If he does both decent, he’s not that bad. Take him as a number 3 outfielder, and hope that he can combine his power and average numbers. Hunter isn’t too bad of an option as your last outfielder. He can hit 20+ homers, score and drive in 80+ runs, steal a few bases, and hit for a solid batting average. He doesn’t have too much upside anymore, but he’s still a pretty solid player. I’m not a big fan of Swisher, but he consistently puts up pretty good stats. He’s good for around a .270 average, 20-25 homers, and 80-90 RBIs. That’s not too bad. He’s an OK option as your number 3 outfielder. Kubel hit a career high 30 home runs last season. No one ever doubted that Kubel had serious power hitting ability. He should get even more at bats this season, which means more home runs. He’s an OK option as your 3rd outfielder. Reddick is another one of those young power hitters. He hits a lot of homers, 32 last year, which means he also should drive in a lot of runs, 85 last year, but that’s really all he does. He could improve his power numbers since he’s still young, which makes him an OK option as your 3rd outfielder. Soriano has proven that he is a great power hitter. He displayed his power hitting ability yet again last year by slugging 32 homers and driving in 108 runs. This makes him a solid option as your 3rd outfielder. Hart can hit for power, which makes him a viable option on draft day. He hit 30 homers last year, and there’s no reason why he shouldn’t do it again. He’d be an OK option as your 3rd outfielder. Zobrist is good for a decent batting average, 20 homers, 15 steals, and pretty good RBI and runs scored numbers. He’s not your best bet as an outfielder though. However, he is a good option at second base or shortstop, so draft him there. Gordon isn’t the player he was hyped up to be and sadly he never will be. However, he can still hit for a high average and slug about 20 homers while doing it, which makes him a pretty good option as a number 3 outfielder. Markakis hasn’t played up to his ability during the last few years. Last season, he had an excuse since he was injured. If he could remain healthy, he could bounce back and play as well as he used to. Take him as your number 3 outfielder and maybe he’ll perform like a great number 2 like he used to. Ichiro hit .283 with 9 homers and stole 29 bases last season. However, he was a lot better during his time with the Yankees than he was with the Mariners. In 67 games in New York, Ichiro hit .322 with 5 homers and 14 steals. Over the course, of a full season, those are pretty good numbers. He’s an OK option as your number 3 outfielder. Myers may not start in the majors, but he will definitely end up there, probably soon. He hits for both average and power and is the number 4 prospect in the league according to Baseball America. It’s only a matter of time before he gets to the majors and he is hoping to become this year’s Mike Trout. Either take him at the end of your draft, or keep an eye on him to find out when the Rays are promoting him. Taveras is another prospect that hits for both average and power. He’s only in AA however, so he may not be playing baseball in the majors as early as Myers is. But he should show up in 2013. Grab him when he is promoted, he could wind up being a great addition to your team. Although Hamilton was a shortstop, he will most likely play in the outfield when he makes the majors. He could make the majors out of spring training, but he’ll likely get some playing time in AAA first. He stole 155 bases in the minors last year, breaking a record. He gets on base frequently and steals it better than anyone. Keep an eye on him, because he should be able to make an immediate impact when he’s in the majors.